Belize is known for its bonefish, which tend to be smaller but considerably more “willing” than Florida fish. BELIZE stands out as one of those remarkable fly fishing destinations that offers a large variety of fishing in some of the least spoiled coastal environments in the world — all within a short plan ride of major U.S. airports. Beyond that, it is the only Central American country where English is the primary language. Which is not to say that Belize doesn’t offer a cultural experience (one day in Belize city will disabuse you of that notion). From the uber-civilized, upscale lodge to the single-boat, single-guide excursion to a combined fishing/ecology/history adventure, there’s a Belize itinerary to suit just about every taste. Belize is considered primarily a bonefish and permit fishery, but there are year-round opportunities for tarpon as well, and the season for tarpon lasts longer here than in Florida. 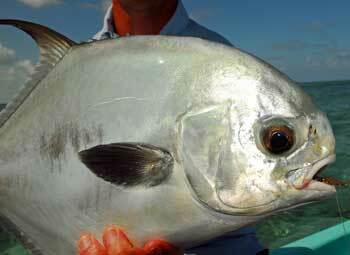 Almost the entire range of Belize islands and flats are considered prime permit territory (indeed Ambergris Key in the north lies only 100 miles south of Mexico’s famed Ascension Bay), and many anglers catch their first permit here, especially if they are able to to fish less-pressured areas. The tarpon in Belize also tend to be more aggressive than in other, more actively fished parts of the Caribbean and Florida. 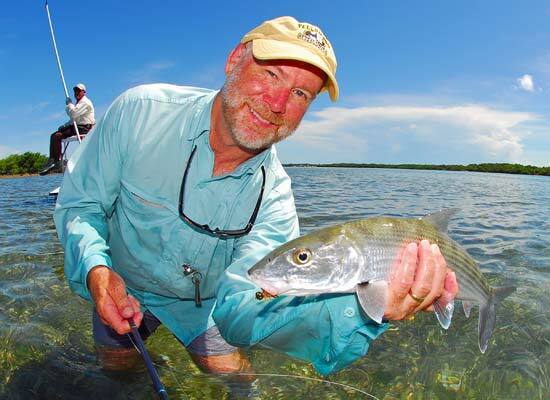 The bonefish average two to three-and-a-half pounds in most locations, but there are lots and lots of them, and it is not at all unusual to catch fish in the four- to seven-pound range. Belize rivals the Bahamas as a perfect place to get hooked on bonefish. Snook, crevalle jacks, barracuda and sharks round out the set of more common species pursued by fly fishers here. Belize is a small country roughly the size of Massachusetts. It has a total land area of 8,867 square miles and a population of 255,000. With just under 30 inhabitants per square mile, Belize is Central America’s most sparsely populated nation. Almost 50% of the country has been protected as parkland or nature preserve, which partly explains Belize’s reputation as a pristine adventurer’s paradise. Centuries ago, Belize was the heart of the Mayan Empire, and archaeologists estimate that at its peak, one to two million Native Americans lived within the borders of present day Belize. The approximately 255,000 people in Belize today are a mix of Creole, Garifuna, Mestizo, Spanish, Mayan, English, Mennonite, Asian, and Eastern Indian. More than 40% of the population are Mestizos, descendants of mixed blood Mexicans and Yucatec Mayans who fled from the Yucatan region of Mexico in the mid 1800’s. The Creoles, which form 30% of the population, are descendants of the intermingling of the early British settlers with African slaves from Jamaica. Another 6.6% of Belize’s population are Garifuna and 11% are Mayan — both have their own language and culture. The climate in Belize is subtropical, with continuous, prevailing breezes from the Caribbean Sea. The country has an average temperature of 79 degrees Fahrenheit, and the humidity is nicely tempered by the ocean breezes, especially on the outer islands. During the summer months, the temperature rarely exceeds 96 degrees Fahrenheit. Winter lows are seldom below 65 degrees Fahrenheit, even at night. On the flats, the water temperature will vary between 75 and 84 degrees Fahrenheit throughout the year. Annual rainfall ranges from 50 inches in the north to 170 inches in the south. The rainy season is usually between June and August and the dry season is between February and May. As in any subtropical setting where bug spraying is almost non-existent, no-see-ums and even mosquitoes can be a problem in Belize, so be sure insect repellent is a part of your trip supplies. While bonefish draw more anglers, knowledgeable travelers have been favored Belize for a tarpon season that lasts longer and is less migration-dependent. 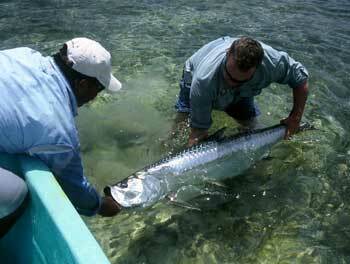 The Cayes (pronounced keys), the offshore atolls, and the barrier reef are Belize’s main angling attractions. The barrier reef, which is 185 miles long, is the longest barrier reef in the Western Hemisphere. The Cayes are islands and/or mangrove clusters that are located between the mainland and the barrier reef or on the barrier reef itself. There are thousands of Cayes scattered throughout the coastal waters of Belize. Many of the flats in Belize have soft bottoms and are therefore difficult to wade; much of the fishing in these areas is done from the boat. There are, however, several locations where the flats are sandy enough and hard enough for wading. Bonefish flats around Ambergris Caye and Turneffe are prime wading areas and allow for a nice change of pace from fishing out of the boat. (If you want to wade fish, be sure to tell your guide.) The waters of Punta Gorda and Placencia offer anglers a great opportunity to wade and sight fish for cruising and tailing permit along hard sand and turtle grass flats. As far as water quality and clarity, the conditions in Belize are almost always clear. While wind or rain will occasionally cause the water to appear cloudy or murky, these conditions can pass quickly with a change in the weather or a shift in the wind. Back rubble flats that lie just behind reef lines are typical of the environments where bonefish and permit can be found on the outer cayes of Belize. Sturdy wading shoes are a must if you plan to wade these flats. One condition that is almost always a factor in saltwater — and Belize is no exception — is wind. Due to the winds coming off of the open ocean, most fishing areas in Belize are subject to a constant and ongoing breeze. While calm, wind-free days are possible, prepare for your saltwater experience by practicing your casting on windy days. Practice casting both into the wind and across the wind prior to your arrival. It is normal for the winds to be down in the mornings and early afternoons, picking up later in the day and into the evening. While Belizean bonefish average around three pounds, it is not unusual to see schools of dozens or even hundreds of fish tailing on the flats or mudding in water that is 2-5 feet deep. The majority of bonefish in Belize are caught on the shallow flats where they actively feed on crabs, mollusks, shrimp, worms and other small creatures. Nine-ten-foot, 10-pound test leaders are typically adequate for Belize bones, but in extremely shallow water or calm conditions 12-foot leaders may be needed. Note that on many occasions in Belize very small (size 10) unweighted flies will catch fish when larger patterns fail to produce; always bring some smaller, ultralight patterns. Belize ranks with Mexico as a top location to find and land a first permit. The tarpon in Belize inhabit such a wide variety of settings that it is almost impossible to generalize about effective flies. For the most part, taking some large and small flies and being sure you have dark, medium and light patterns is a wise idea unless you have specific instructions from your guide or lodge. Nine-foot, 16-20-pound tippet leaders with shock tippets are recommended. Some lodges, like Turneffe Flats on the Turneffe Islands atoll 30 miles east of Belize City, go the extra mile in providing for guest comfort. Others require a bit more “flexibility” in angler expectations but offer the possibility of even more remoteness. The flights from Houston, Dallas, Newark, Miami and Charlotte to Belize are all approximately two to three hours long. During the flight you will be given two customs and immigrations forms that you will need to complete before you land. Fill out all of the required information on these forms, folding them inside of your passport once they are completed. These forms will be checked upon arrival into Belize City; one copy will be retained and the other will be given back to you. Do not lose this copy as it must be turned back in on departure. When you land at Phillip Goldson International Airport in Belize City, you will proceed through the arrival door and find yourself in what is usually a fairly short immigration line. The friendly Belizean customs agents will stamp your passport and you will proceed to the one and only baggage carousel to claim your checked luggage. Once you have retrieved your checked bags, grab one of the free luggage carts and load up your gear before moving on to the customs line. You will probably want to head for the “Nothing To Declare” line, where they typically waive you right through. (Be sure to tell them you’re there to fish!) A group of loud and friendly baggage handlers with carts will be waiting on the other side of the customs tables to assist you from that point on. These guys work for tips only, so be sure to throw them at least US$1 per bag for their assistance. While the fishing can be fantastic, Belize is the kind of place that often makes us want to chill out and enjoy the scenery. If you are heading to Turneffe Flats Lodge or Belize River Lodge, they will load your bags and direct you through the door into the main terminal lobby where a representative from the lodge will be waiting with a sign. If you are headed to Turneffe Flats, you and your gear will be loaded into a van for the short ride through Belize City to the boat that will take you out to the island. If you are headed to Ambergris, Punta Gorda, Dangriga or Placencia, you will head to the ticket counter of either Maya Island Air or Tropic Air (check your final itinerary to determine which one). Re-check your luggage at the domestic air counter and proceed to the departure lounge to await your flight. The lounge is where you will find the “famous” Jet’s Bar, a great place to enjoy your first cold Belikin beer while you wait. Next you will probably board a plane for a quick hop to your final destination (15 minutes to Ambergris, 35 minutes to Placencia and 45 minutes to Punta Gorda.) When you arrive, you will be met by a representative from the lodge and transported to where you will be staying. When you first arrive in Belize and switch to a domestic flight going anywhere in the country, you may be asked to pay an “airport security tax” of seventy five cents. When leaving the country at the end of your stay, there is a US$35.00 Airport Departure Tax per person. These days, most airline tickets (including those purchased on-line) include this departure fee in the initial purchase price, but if you don’t know whether it was included, be sure to save at least that much in cash, as payment of this tax is required to depart Belize. If you have a guide who has worked hard to put you on to fish and help you succeed, a tip of US$30.00 – $40.00 per boat, per day, is the norm. Something as special as a grand slam, an exceptionally large fish or a longer-than-average day on the water may merit a little more. At most lodges, you’ll want to tip your guide directly at the end of your trip. For a lodge’s staff, an additional combined tip of US$75.00 – $100.00 per guest for the week is about average. In most cases the lodge manager will be happy to handle this part of the tip and distribute to the lodge employees accordingly. 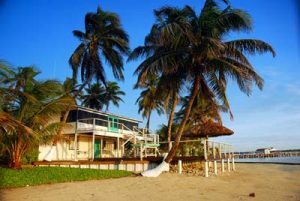 You can certainly book a flight to Belize City, stay in one of the major hotels there, and arrange for private guides to take you fishing from there. You can also visit just about any major resort in Placencia or Ambergris Key, for example, and find guided fly fishing on your own. And you can book directly with most lodges. But there is no question that the most convenient way to fish Belize is by using the services of a travel agent who specializes in fly fishing destinations. They don’t charge any more than if you book the lodge directly, and the best ones provide a ton of pre-trip advice — checklists, fishing reports, weather updates, tackle recommendations — that is hard to find from other sources. Above all, if you do book a trip through an agent, be sure to ask for their input on tipping, food and room accomodations, and any special situations that are unique to your in-country destination. Yellow Dog Fly Fishing of Bozeman, Montana books several lodges in Belize, including Turneffe Flats Lodge, El Pescador, Belize River Lodge, Inn at Robert’s Grove, Whipray Caye, Machaca Hill Lodge, and Robert’s Caye. Phone: (888) 777-5060 or visit their Web site at www.yellowdogflyfishing.com.